The iconic mushroom-shaped cloud from the Operation Crossroads nuclear explosion tests at Bikini Atoll on July 25, 1946. Commemorating the 75th anniversary of the first controlled sustained nuclear reaction on December 2, 1942, as well as the 50th anniversary of the unveiling of Henry Moore’s sculpture Nuclear Energy, “Nuclear Reactions” will continue throughout the quarter, culminating on the anniversary itself. With the support of the Smart Family Foundation and the Franke Institute for the Humanities, the University welcomed Serge Guilbaut, professor emeritus of art history at the University of British Columbia, to kick off the series. Standing before a packed lecture hall in the Cochrane-Woods Art Center, Guilbaut focused on the year 1946. His lecture, entitled, “Cold War Under a Soft Cloud: Politics and Art Around 1946,” traced the influence of the United States’ nuclear tests at Bikini Atoll on the American psyche, and its manifestations in American and European art. Although American consumer culture was optimistic following the destructive Great Depression and World War II, it was not blithely euphoric: “Tensions between East and West [were] beginning to rise,” explained Guilbaut. 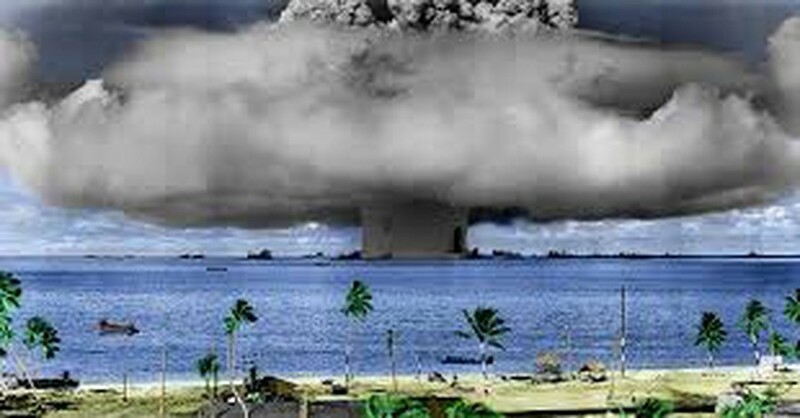 “Pleasure was mingled with anxiety in the American imagination,” as the iconic image of the mushroom cloud above Bikini Atoll entered the national consciousness and the public was forced to ponder the possibility of the Soviet Union acquiring the same nuclear capabilities. Indeed, reminders of the dangerous and uncertain future penetrated popular culture; as Guilbaut pointed out, the invention of the atomic cocktail, packing a hell of a punch, and the bikini swimsuit, guaranteed to make beachgoers drop dead, are just two of many examples. In the case of artists living in 1946, argued Guilbaut, the distressing conditions of modernity weighed heavily on their minds, even if these anxieties were not as blatantly expressed as in Philip Evergood’s 1946 painting Renunciation, in which a Bikini-esque mushroom cloud propels projectiles around the canvas, and anthropomorphic apes take refuge near a brick wall. But Guilbaut noted that even Jackson Pollock’s Eyes in the Heat series of the same year is undeniably visceral, tactile, eerie. The thick globs of paint create a relationship with viewers, whereby they are drawn into the paintings’ physical space, and become agents in examining its beautiful, alarming disorder. Even the name—“eyes in the heat”—is discomforting. Decades later, existential anxiety and primordial anguish were far from my mind when, in elementary school, my art teacher showed us images of Pollock’s splatter paintings. Guilbaut also invited his audience to examine the differences between artworks produced in the United States and in Europe, which can be partially attributed to political circumstances. Embroiled in the Soviet Union in a battle for influence, the United State poured money into demonstrating abroad its superiority. The State Department even purchased, directly or indirectly, 79 oil paintings and 39 watercolors for the 1946 exhibition Advancing American Art in Prague. “The issue at stake: How could we, or should we, illustrate America,” summarized Guilbaut. After a summer of anxiety over escalating tensions with North Korea, Guilbaut’s lecture, and perhaps the entire “Nuclear Reactions” series, seems timely. The event was part of the University’s on-going commemoration of the 75th anniversary of the first self-sustaining nuclear reaction.